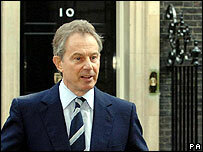 This week on More or Less, we offered the pick of the numbers from 10 years at Number 10 for Tony Blair. There have been quite a few, what with an explosion of league tables, performance indicators, targets and the like, as well as the usual measures of the performance of the economy, and they have saturated the news and politics as never before. But for what it tells us about how the country is changing and how the government has tried to influence its course, we examine one set of numbers in particular, said to be worthy of becoming Tony Blair's monument. Find out what they are, and what they tell us in this week's programme. We also had our own guide to the age of the trillion. It is a big number, but how big? And why has its time arrived? Get it into proportion with some suggestions from the team. And there was more on our reporter's continuing attempt to claim numbers from men. Brace yourself for some caricatures, as she set out to discover numbers' feminine side. And see how beautiful maths can be with a crocheted version of the "Lorenz Manifold", featured in this week's programme. BBC Radio 4's More or Less was broadcast on Monday, 7 May, 2007 at 1630 BST.